CoMixité is a story. It’s a story about Paris, about education, and about the future. It’s a story of how children can be the creators of their own education. It’s a story about how we can empower children to make academic learning more hands-on, effective, and fun. 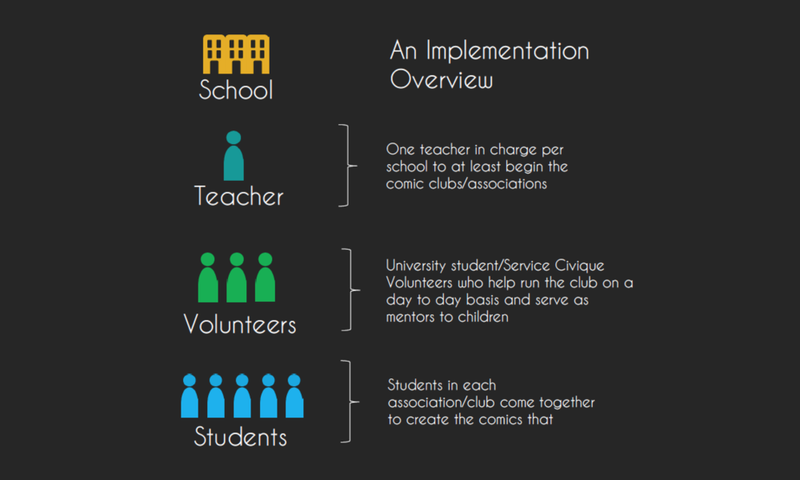 CoMixité aims to create an educational cartoons magazine, where the comics are made by children, for children. The idea behind CoMixité is simple: people learn better when learning with images rather than with plain text alone. Visual learning is the new trend in educational systems worldwide. Rather than having children learn from cartoons that we make for them, with CoMixité, children imagine the educational content, create a humorous scenario, and draw the comics themselves. CoMixité lets them express their imagination, creativity and sense of humour. Since the CoMixité magazine will be distributed to every Parisian primary and middle school student, it will also display the diversity of artistic and educational voices within the city. Moreover, once a year, children will come together at a weekend CoMixathon to make comics in small, diverse student teams that will increase social integration and educational creativity.Educational, fun, and integrative, CoMixité is a story you want to believe in.